"I'm going to sow some broad beans". It sounds like a simple enough task. Like you can just pop outside for a few minutes and quickly sow the beans. But of course it isn't so straight-forward. Before you sow you have to make sure the bed is ready. And for the bed to be ready requires preparation. And of course you have to work out where in fact you want to sow the broad beans, before you even start all of this. 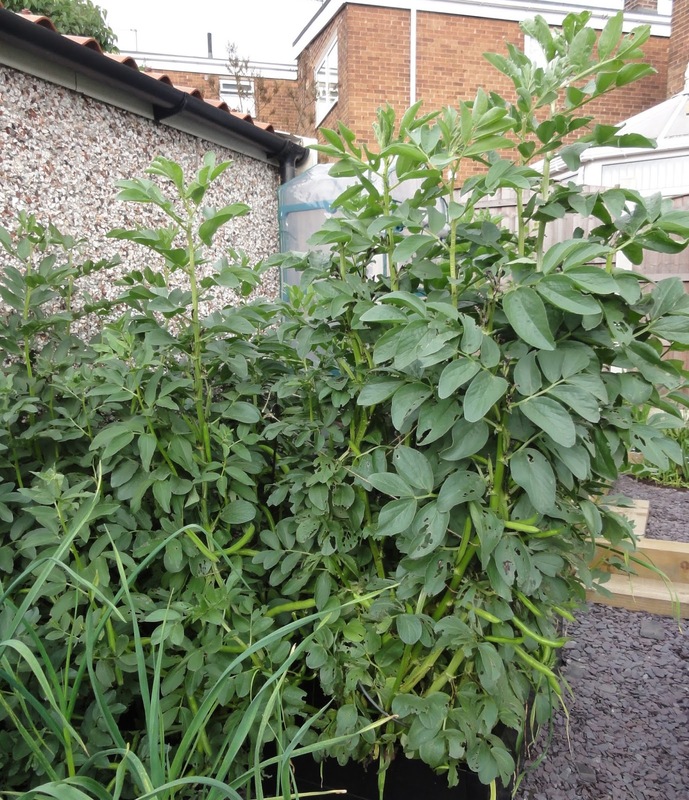 I had the most amazing crop of broad beans ever in 2014, from an autumn-sowing in 2013. I don't know whether it was because of the mild winter of 2013-14, or the fact I wasn't sowing them on an allotment where a majority of the beans would get eaten by mice. Possibly a bit of both. Anyway, I'm hoping to repeat the performance in 2015 and in early October I was thinking, it's time to sow the broad beans. So here is the Gardening with ME way to sow broad beans. It takes several weeks and you only sow about 30 beans. But if I get a crop like this summer past, I'll be getting several kilos of beans in return. My physical energy levels are very low, so I recognised straight away that I needed to work out how to break down the task of 'sowing broad beans' into a series of micro-tasks which could be undertaken over a period of time. Crop rotation plan: You have to know where you are going to plant the beans. I did a crop rotation plan back in early 2014. So that work was already done. Tick! Removing previous plants: During 2014 I had tomato plants growing where I wanted to plant my broad beans, so they had to be removed. I did this early October, so this was the first job in this process this year. Pulling out the canes and strings: these were supporting the tomatoes and needed taking out. I left the canes behind the garage, where autumn-winter-spring rains should wash them out. I don't particularly bother with cleaning canes usually, but as the tomatoes had a bad case of blight, I wanted them left outside to let the elements clean away and kill off any blight spores left. Picking up compost/leafmold: Usually I would use compost (either my own, or some bought at a garden centre), however I was lucky enough to pick up some bags of amazing leafmold from Heeley City Farm. I did this between the last task and the next. Weeding: I try to practise no-dig gardening and it means that I don't get a lot of weeds. I still get a few though, and I cleared those next, a couple of weeks later. Preparing soil with leafmold: for this job I needed the help of Kevin, as I couldn't lift the leafmold bags. With his help, it got spread out evenly. Placing the canes and string: I think it was early November by the time I got to this point. I wanted to grow three varieties of broad beans in a 1m x .75m space. These were: The Sutton (a dwarf broad bean, sown in the bottom triangle so the taller ones will be behind it - from a sun perspective), Aquadulce Claudia and Bunyards Exhibition. Based on past experience I've learnt that different beans will perform differently year to year, so growing a couple of varieties is a sure way of getting a good crop, even in this small space. So I placed the canes out to divide the space by thirds, then used string to separate out where the different varieties would be growing. Sowing the broad beans: finally - the "I'm going to sow broad beans" bit! Placing the canes and string took up more time and energy than you would think, about 1 hour. Maybe I'm a perfectionist... But it meant that the actual sowing of the broad beans didn't happen until the day after the placing of the canes and string. Sowing the beans took all of 10 minutes. Possibly less. 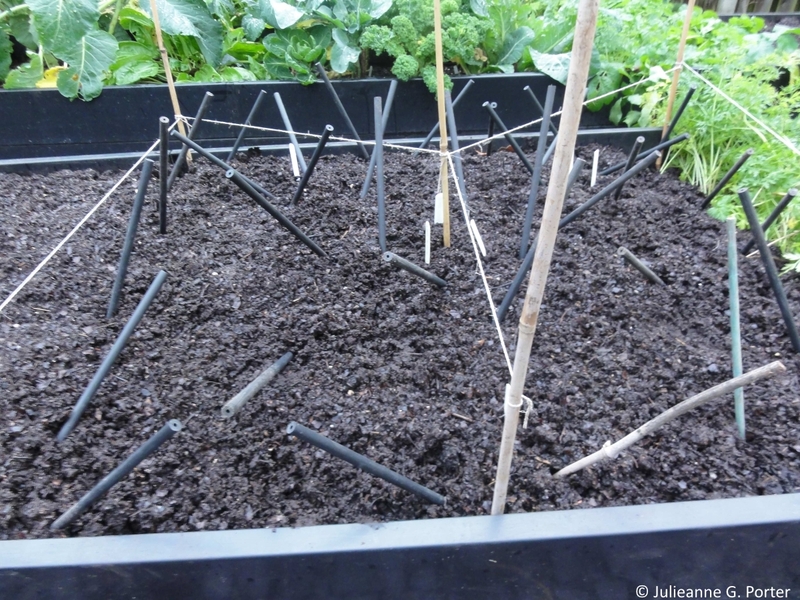 Putting down the sticks: the final task was to put down some sticks to stop cats and foxes from digging in the bed whilst the beans germinate. I find this trick works pretty well, and I found the next day my beans were fine, but in a fallow section of the vegetable beds, there was evidence of footprints and digging. Again, this was a simple task, but I still took a short break between sowing the beans and placing the sticks. That's because bending over to sow the beans takes up a surprising amount of energy when you have ME, and I needed to rest for 10 minutes before doing this last task. So as you can see, sowing the beans themselves is indeed a simple task and did, in fact, only take 10 minutes. It was everything else around it that required most of my time and energy. It's done, and I'm a happy bunyip. There you go, sowing broad beans via micro-tasking. Very well written. I don't think a lot of people realise just how long everything takes with ME and that even 'small' tasks need to broken down further. Thanks Tim :) It's been a big learning curve as I didn't have to think about the detail in the past, pre-ME. Have you had/or have ME? Pacing was really hard. It sounds simple, but so much about managing ME is mental & emotional. I found a counsellor who had an understanding of ME/CFS and that really helped. I'm finding blogging about it helps too. Not only with breaking tasks down, but seeing how much I can get done, even with limited energy. Yes - please do join the meme - I'd love the read and learn about the experiences of others gardening with ME. On a separate note: I saw on your Twitter profile that you are an AAT student - me too! I've just recently started doing the Bookkeeping course by distance learning as it means I can work around my energy levels. I'm really enjoying it. What one are you doing? My wife and I did AAT level 2 at college last year, it was only 1 night a week, but I found it exhausting. So, this time, we've bought the level 3 books and are doing it at our own pace. How are you finding studying AAT so far? Thanks for letting me join the meme. Your inspiration has given me a lot of ideas. I've tended to only vaguely mention that I'm ill before, but I feel a bit more confident about it since recently receiving a firm diagnosis. I thought of doing it at college but was worried about whether I'd always be able to attend. Distance learning has worked out really good so far. You get tutor support (answering your questions etc) and use their online programme, but do it all at your own pace. My plan is to do the Bookkeeping element and then go on to complete the other modules of Level 2 if I feel up to it. So, pacing myself...! It must have been nice doing it together and being able to talk about your questions and understandings. I got formally diagnosed about 18 months ago, but have ME longer than that - just didn't have a name for it. Having a name somehow makes it legitimate - like it's not just I'm tired/lazy, but I have a genuine illness. I'm looking forward to reading your blogposts. It will be really great to read how another gardener manages gardening and ME. It was nice studying it with others, but because everyone always had lots of questions, it could be very tiring. I have to say that I found the bookkeeping element the most difficult, after that it felt progressively easier. Good luck with it! I was formally diagnosed this August, but like you have had it longer than that - since January 2012. I had a draft post written about ME, so will amend that and will probably publish it next Monday as I have an announcement to make tomorrow! I usually love learning with others, but I can see what you mean. When you have ME, so many questioning etc can make you feel dizzy & tired and bring on brain fog. I look forward to reading your post and hearing your news!